While most of the major airlines were focusing on transcontinental flights, Eastern's specialty was the East Coast, and it was here that it established a near monopoly. Through 1933, the airline acquired contracts for a number of routes that spanned from New York to Miami. Eastern catered to the high demand for quick passenger travel between the northeastern states and the vacation areas of Florida. In April 1938, Rickenbacker, with the help of some of his associates, bought Eastern. 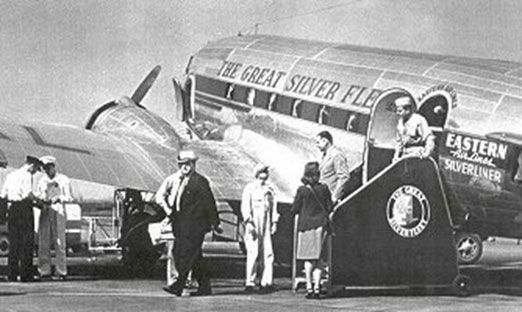 Rickenbacker was responsible for setting up Eastern’s Great Silver Fleet, a famous fleet of DC-2 aircraft that operated on the East Coast, one of which became the first commercial airplane to touch down at Washington, D.C.'s new National Airport in June 1941. It was also under Rickenbacker's reign that Eastern became the world's first airline to begin mail service using autogyros. (An autogyro is a type of rotocraft that uses an unpowered rotor in autorotation to develop lift, and an engine-powered propeller, similar to that of a fixed-wing aicraft. On July 6, 1939, it began an autogyro service in Philadelphia between the city's post office and Camden Airport in New Jersey. The service lasted about a year. In World War II, Eastern joined in supporting the war effort with military support flights connecting Florida, Pennsylvania, and Texas. Further routes were added to Trinidad in the Caribbean. Eventually, in September 1942, Eastern created its Military Transport Division (MTD) based in Miami comprising a fleet of Curtiss C-46 Commando aircraft. After the war, Eastern became even stronger. In 1950, the company ordered the new L.1049 Super Constellation airplane. Eastern also successfully acquired a Canadian company, Colonial Airlines, in 1956 that allowed the airline to begin service to Canadian cities such as Montreal and Ottawa. Eastern also diversified into Mexico, when in 1957, it began a New York-New Orleans-Mexico City service using DC-7 aircraft. Eastern's first 727 flight took place on the Philadelphia-Washington-Miami route on February 1, 1964. Eastern also used the Douglas DC-9, beginning February 1965. Rickenbacker had already left Eastern by then, retiring on December 31, 1963 after nearly a quarter century leading the company. In 1967, EAL began flying passengers to the Bahamas and to Seattle on the West Coast. The company also expanded into the Caribbean in 1971 by acquiring a small Puerto Rican company known as Caribair. Eastern inaugurated its first coast-to-coast flight in 1969. In the 1970s, Eastern's big purchase was that of the European Airbus A-300. Airbus had tried unsuccessfully to break into the U.S. market for many years. After Airbus offered a very generous deal to Eastern, Eastern's new president, former NASA astronaut Frank Borman, agreed to buy 23 of the new jets in the spring of 1978. Eastern did not fare well in the 1980s. The company was in deep trouble because of major disagreements between management and the labor unions, and because of major debt from purchases in the late 1970s. Eastern began to rack up year after year of losses until late 1985, when it had a debt of $3.5 billion. It was at this point that Frank Lorenzo, who controlled Continental Airlines, stepped in and bought the whole airline for only $615 million, adding Eastern to his existing prizes of People's Express, Frontier Airlines, Texas Air, and New York Air. Lorenzo used Eastern's core assets for his other airlines, devising various ways to use them to make money for his other properties. 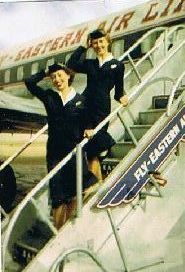 In January 1991, Eastern Air Lines ceased operations. This was the end of a wonderful airline and a sad time for its employees and loyal passengers. The photos below of Eastern Air Lines planes were provided by Bill Hirsch. These photos represent the planes that most of Silverliners worked as cabin crew. The Purpose and Creed of the Silverliners. Interested in finding out more? Fill out our contact form below to get started!